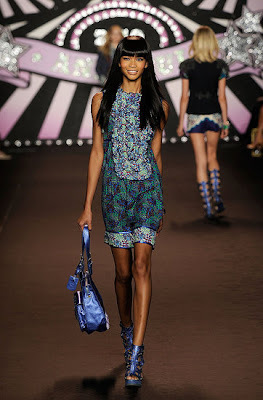 i love how Anna Sui rocks the bryant park tent with the spring summer 2010 collection. The circus theme is so fantastical and how she collaborates with the material is amazing. There are combinations of military frocks like the jacket/outerwear, boho spice of floral, and the preppy school girl look. Some accents of the circus theme is shown through the marching band hats, and accesories. Moreover, metallic embelishment and gladiator like platform is still being used. This is where the 60s victorian meets the edgy style. feels like going to the beach when seeing this Christian Siriano's outfit. adorable sequins pants! i just love the patterns she uses! thanks for visiting :) sekolah di smak5 nih, kamu sekolah dimana? This collection is gorgeous! I love the light blue outfit (short and big hat). Thanks for sharing. ohhhh love love love! esp the flowing assymetrical dress plus the shoes..
its so nice to see real color. and the mix of materials and textures is brilliant. what a fun show that must have been. reply from my blog: i don't have any plan dear. i'm sleeping all day and do my ASSignments at night. lol. pathetic. I love the Anna Sui collection. Such great patterns and colors! Anna Sui has been my one of my favourites. anyway, thanks for visiting my blog. 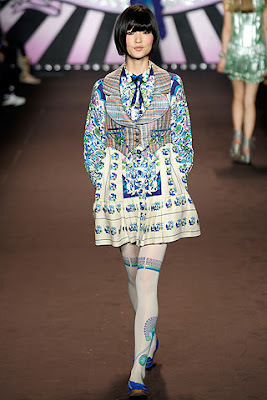 Anna Sui was brilliant...absolutely stunning! I also love the circus theme - so perfect! I LOVE RODARTE. RODARTE = ART!